Some of the themes i published for public consumption. There are many newsletter plugins around so what’s new in this. Good question, well there might not be some thing very new but there are some things which make me to wrote this simple plugin. It is a simple plugin with Admin option page to download the user data in csv format for selected dates. I was not after many options, i wanted a simple plugin which just work the way i want it and this is why i wrote this plugin from scratch. Want to read more details, no worries read them here. Installation and usage is written there in details too. Tested with WP 3.5, but should work with 3.0+ versions. Enough of reading, lets see it in action. Sorry there is no live demo at the moment but these screen shots will do the justice. Time to download and install it, head over to gitlab and download or pull the files. Got issues or need help, there is an issue page on gitlab for it post it over there. 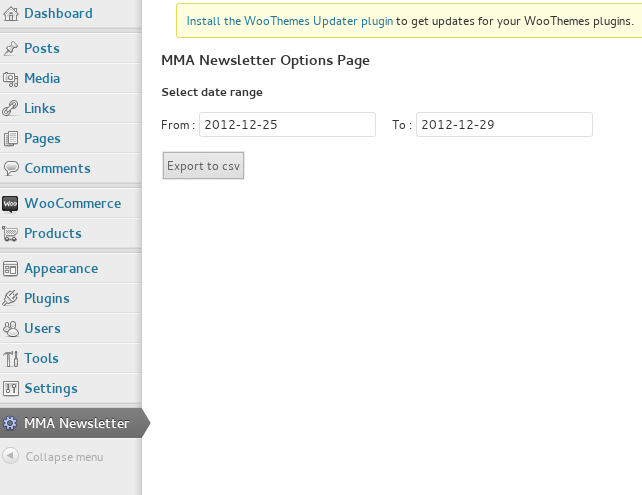 The directory name should be mma-newsletter. Remove other words, hyphens etc after extracting.